You will find this quaint and comfy 1 bedroom 1 bath apartment to be perfectly situated for the ultimate experience in Salt Lake City. Whether you're in town for work or pleasure, you're only 1 block from the Capital, 5 blocks from the heart of downtown, a short walk to City Creek state park, 6 miles from the University of Utah, 3 minutes from the I-15 exit and a 10 minute drive from the Airport. All the while, your're only 45-90 minute drive from 8 different world class Ski reports. Our home is a 100 year old house, originally a farm house. 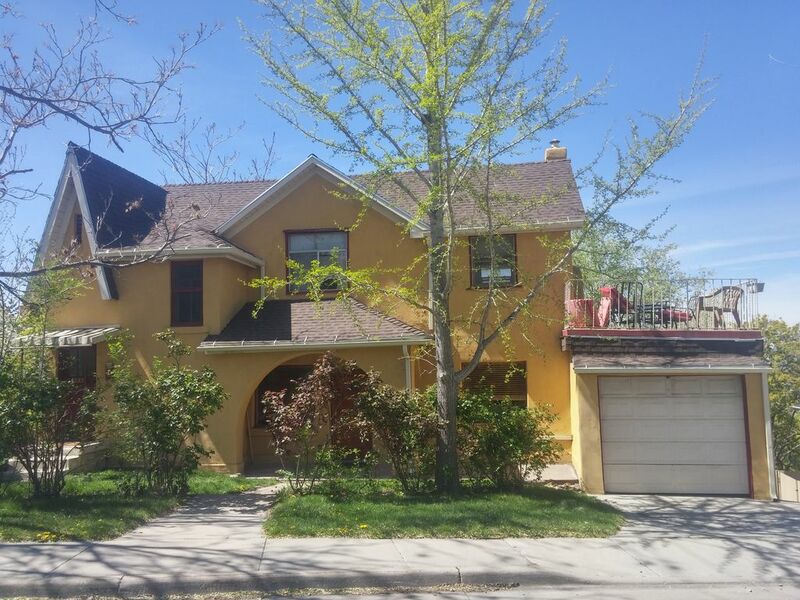 It is located in the historic Marmalade District of Salt Lake City, one of the oldest neighborhoods. The apartment reflects some history with arched ceilings and wood frame windows. In the afternoon the sun's reflection off the Great Salt Lake appears as a mirage through the western windows. Start your morning looking off the balcony over the great Salt Lake and the northern part of the Wasatch valley. Inside, staying on the upstairs level, you'll find a fully stocked kitchen with all the amenities needed for cooking, whether its a quick pizza in the oven or a fully prepared meal... and if anything is missing, there is a great host willing to quickly respond to guest's needs. Furthermore, there are new large sized washer and dryer if you're simply passing through and need to freshen up your cloths. For sleeping accommodations, there is a full-size bed in the bedroom, and a pullout queen mattress (extra padding/foam top can be found in the bedroom closet) is in in the living room. View more about Nathan C.
Access to the bathroom is through the bedroom. See photos for details. Password and Network name can be found on the fridge. It has everything you need. If anything is missing and doesn't cost an exorbitant amount, I would be happy to provide it. Has the basic public channels through a digital antenna. HTML cable also available. Great place. A little out of the way but I would definitely rent Gris spot again! Nathan was a great host . The house was clean and well supplied .. just a short walk to downtown and easily accessible from the freeway. I would stay again ! Spent a few days in Salt Lake to ski. We found the place clean and had a nice visit. Very nice people and apartment. Nice place to stay for couple. Real cute, nice kitchen with all supplies needed and great views. Cozy bed too. Close to downtown and nice drive to Park City to ski. Enjoyed our stay. Thank you. Great couple, easy to communicate with, quite and respectful. Welcomed back anytime!